Have delicious breakfast and check out from Cochin hotel to proceed for Munnar. The only hill station of Kerala, Munnar is about 1600 feet above sea level. Devoid of pollution, enriched with fragrance of tea plants and soothing with lush greenery all around, Munnar, a highly cherished tourist destination, offers to view panoramic view, sprawling tea plantations, Tea Museum, lakes, wildlife sanctuary, small brooks and streams, picture-book towns, small brooks and streams, thickly-wooded forests etc. On the way to your hotel, visit Cheyyappara waterfalls, a perfect feast for your eyes. On arrival at Munnar, you will be transferred to Munnar hotel. Enjoy the rest of the day at leisure and return back to the hotel for a comfortable overnight stay. Having enjoyed relaxed wake-up and breakfast, proceed to see and experience natural beauty and blissful climate of Munnar. Leisurely sightseeing comprises visit of Eravikulam National Park (spread over an area of 97 sq. km. and home to Nilgiri Tahr, several species of rare butterflies, animals and birds), Mattupetty Dam, Kundale Lake, Echo point and Tata Tea Museum. Sightseeing tour of Munnar is a mesmerizing experience. Late afternoon return to your hotel and spend evening in leisure. Overnight stay will be in Munnar hotel. Having delicious breakfast in Munnar hotel, depart for Thekkady, the gateway to Periyar Wildlife Sanctuary which is renowned for wild elephants, wild boar, leopards and, of course, tigers. Thekkady holds prominence on Kerala’s tourism map due to three reasons: jungle safari on elephants/ jeep; observing wildlife from a distance while having a boat ride in Periyar Lake; spice plantation tour; Ayurvedic rejuvenation therapy and cultural activities. On arrival at Thekkady, check in at designated hotel, refresh, relax a bit and proceed for a memorable spice plantation tour. You will happen to see the exotic crops of cinnamon, pepper, coffee and cardamom and tea estate. In the afternoon, you shall be taken for boating in the Periyar Lake. Evening can be utilized by indulging in either cultural programs or Ayurvedic massage etc. Overnight stay will be in Thekkady hotel. Having fresh & succulent breakfast in Thekkady hotel, embark on your journey to Kumarakom which is known for its canals, lakes, coves, coconut palms, lush green rice fields, backwaters, luxury houseboat cruises and Kumarakom Bird Sanctuary. On arrival at Kumarakom, check in at lake-side hotel . The whole day has free for leisure. Kumarakom, a tourist hamlet on the bank of Vembanad Lake of Kerala, is endowed with incredibly amazing scenic beauty and all modern amenities to indulge in leisure. Authentic Ayurvedic rejuvenation therapy spas have sprouted in the region in significant numbers. Take rest and relax on your own by watching exotically panoramic view of backwaters, day-to-day lifestyle of local people, migratory birds making diverse formations in the sky etc. Canoes with huge sails still transport people and you will find vegetable sellers, fishermen and other household materials being brought door to door by small wooden boats. One can go in for a sunset cruise (optional) to enjoy splendid scene of the sun-set or the charming beauty of the backwater and the natural view that are simply outstanding. Overnight stay will be in Kumarakom lake resort/hotel. 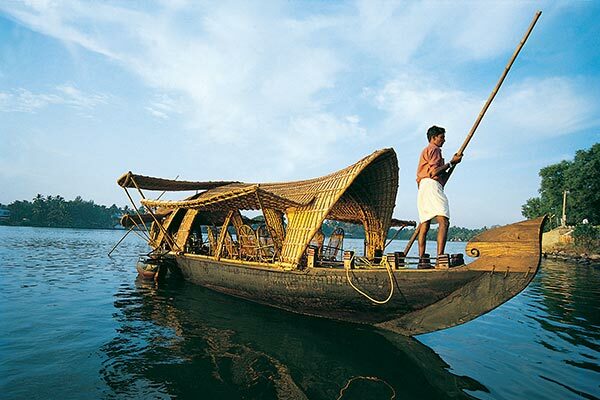 The first half of the day is for your relaxed and languid stay/ stroll in Kumarakom. Have breakfast in the Kumarakom hotel and relish soul rejuvenating views of Kumarakom. There are two options of enjoying houseboat cruise and stay. Either reach Alleppey by road and board houseboat to cruise in the backwaters and canals of Alleppey only or board houseboat near Kumarakom that sails through to Alleppey. Here, we are opting for second option i.e. traversing the distance between Kumarakom and Alleppey on the houseboat. Then, early afternoon you will check in at the luxury houseboat; leisurely enjoy the pleasantly scenic pathways, green lagoons, villages, emerald green paddy fields and exotic natural surrounding while houseboat cruises through the backwaters. While you are relaxing in the houseboat, it is cruising along the backwaters of Vembanad lake and heading towards Alleppey. Your lunch, dinner, breakfast, supper, tea- coffee-snacks, as well as cozy overnight stay will be on the houseboat. Have delightful and delicious breakfast in the houseboat. 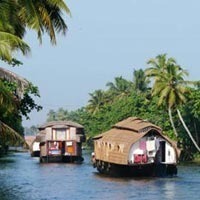 By that time, you shall have arrived at Alleppey. Check out from the houseboat and proceed for Kovalam (190 kms/4.5 hrs). Kovalam is famous worldwide for its exquisite beaches, ethnic surroundings and Ayurvedic rejuvenation therapy and massage. On arrival at Kovalam, check in at the pre-booked Kovalam hotel. 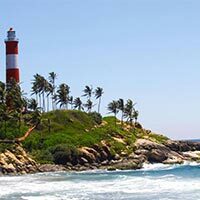 Kovalam has three adjacent crescent beaches, where tourist can enjoy fun-filled time with dear ones surfing the cool breeze as well as playing with the warm waves of the sea water. Have lunch, rest and relax on the alluring beaches of Kovalam. Overnight stay will be in Kovalam hotel. Trivendrum is the new name of Thiruananthapuram. Trivendrum used to be capital and centre of Travancore princely state. Recently it has been in news related to treasure of Padmanabhswamy temple. Enjoy breakfast in the hotel and sunbath at Kovalam beaches. Early in the afternoon, proceed for Trivendrum for half-day sightseeing which comprises Kavadiar Palace, Padmanabhaswamy Temple, Museum and Art Gallery. Later in the evening, return to Kovalam hotel for overnight stay. Day free to indulge in leisure activities like sun bath at Kovalam beach & Ayurvedic massage. Have your delicious breakfast in the Kovalam hotel and relax on the beaches of Kovalam. Early noon, depart for Trivendrum to board flight for your onward destination. In this way happy journey of Kerala tour comes to an end giving you lots of remarkable memories and experience to relish in forever. Kovalam, about five decades ago, used to be an unknown beach hamlet of fishermen. Since unprecedented influx of 'hippies' in the seventies, transformed the small and unknown village of Kovalam into a hotspot tourist destination of Kerala. 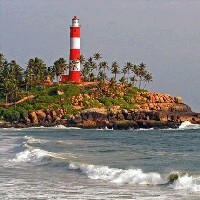 Owing to clean shallow waters and low tidal waves, the beaches of Kovalam are highly popular among the western tourists. Kovalam, 16 kms from Trivendrum, is a serene emerald green sea-beach of Kerala, South India. Discover one of India's internationally renowned beaches. Popular since 1930, Kovalam consists of three successive crescent shaped beaches. A sheltered natural bay, Kovalam beach is juxtaposed between serene blue waters of Arabian Sea and an expansive spread of luxuriant palm groves. Kovalam offers a range of good hotels including heritage properties. The Kovalam beach is appreciated worldwide for diverse and plenty leisure options like sunbathing (the tropical sun tans skin here in few minutes only), swimming, specialized Ayurvedic massage for healing and toning body, exotic cultural programmes and catamaran cruising. The cultural programme and festival of Kovalam is Kerala Gramam, a village festival. 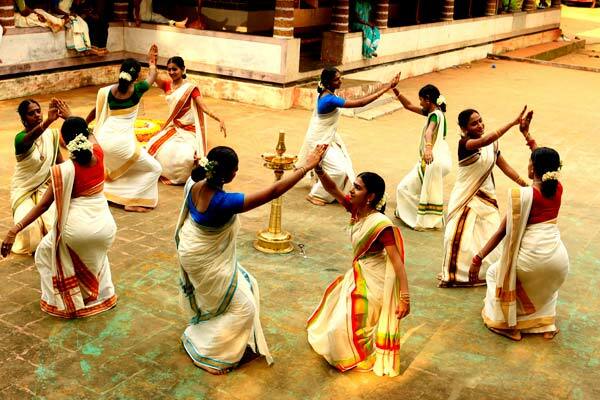 This local festival takes you in the memory lanes of traditionally ancient Kerala. A small village is recreated for 10 days during January 14th to 23rd every year. This endeavour imparts an insight into traditional house, attire, food, crafts and much more. 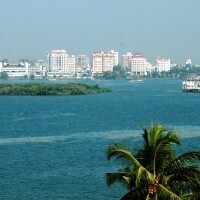 Thiruananthapuram is also known as Trivendrum. The sprawling capital city of Kerala State, 219 kms from Cochin (Kochi) with several of its building overlooking peaceful valleys, Thiruanantapuram is situated at the south-western tip of India. The city, built across seven hills, still retains its regal ambience with a number of colonial and traditional buildings. Ancient Padmanabhaswami Temple, built in a Dravidian architectural style is an important city landmark. Thiruvananthapuram, capital of Kerala, is a beautiful sea-side city built on 7 hills, which had past trade links with many countries outside India. 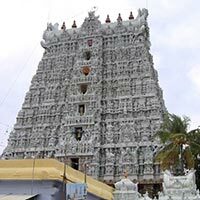 The name is derived from Tiru Anantha Puram, meaning the city of Anantha, referring to Vishnu as Padmanabhswamy. It is also known as the Holy City of Anantha. Marthand Varma, the most famous king of Travancore, dedicated the entire state to the deity and became the Padmanabha Das or the Servant of Lord Padmanabha. The city once formed a part of the erstwhile Travancore state which had its capital at Padmanabhapuram. The present capital city is well located with spacious avenues with several parks. The city forms the entry into the state from the southern side and serves as a base for the tourists who want to visit Kerala and its interesting places. Total Meals: 11 (Breakfast-09; Lunch-01 & Dinner-01). Total night stays: 09 (Cochin-01; Munnar-02; Thekkady-01; Kumarakom-01; Alleppey-01; Kovalam-03). Enjoy incredibly serene beach holidays on Kovalam beach. Ayurvedic massage for physical rejuvenation is a must. Experience a session or two of Yoga.